Meet the HND-9 concept from Hyundai. It's got two doors, four seats, a long hood, and it looks like it's ready to hit the track. Sound like some other Hyundai you know? 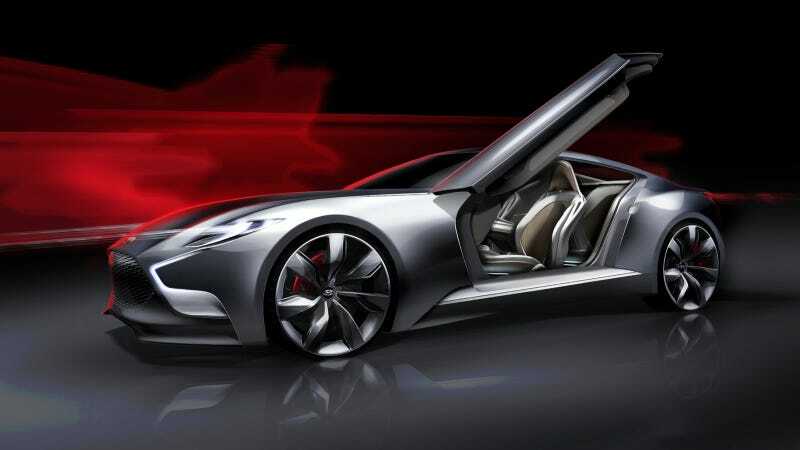 Yeah, more than likely, this concept previews the next Genesis Coupe. When the real thing drops at the Seoul Motor Show next week, it is expected to come with a 3.3-liter turbocharged V6 good for 365 horsepower and an eight-speed autobox. I'm excited to see the real concept in person, because I think these drawings look pretty sharp. More importantly I'm eager to see what Hyundai will do with the second-generation Genesis Coupe. The current one is an impressive performance bargain, but it hasn't exactly set the sport coupe world on fire the way the Toyobaru twins have. With a little more time in the oven, the next one could be a real contender.